Select Project – Projects can be selected from the Left Navigation menu or the Top Dropdown menu. 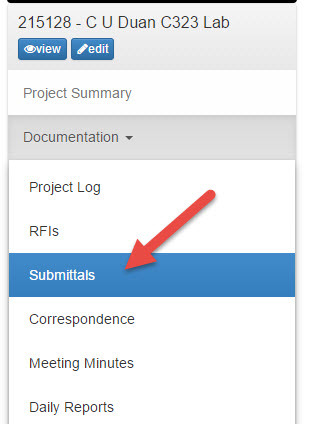 Log into RADAR as a user with the permissions to create and manage Submittals. 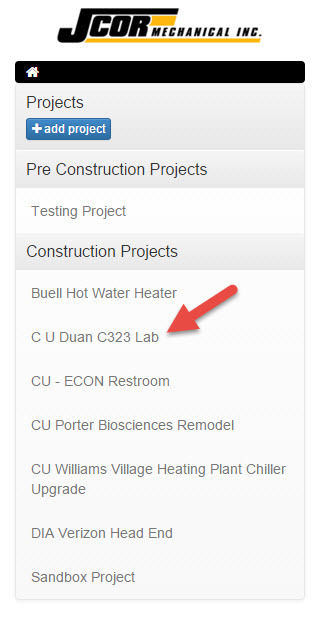 Select > Project – Select from the Left Navigation menu (Figure 1) or the Top Dropdown menu (Figure 2). The Submittal module is located in the “Construction Projects” phase of the module listings. This is where general information is entered for creating the Submittal Package. Most of the information entered will display on the Submittal Transmittal, the Submittal Log and the Project Log. The dates entered will display on both the Submittal Log and the Project Log for tracking when responses are due and received. The Submittal Log tracks the Submittal Package and the Submittal Items within the package. This number is editable. The previous submittal number for the project is listed above the field for easy reference when entering the next submittal number. A letter designation of where package is in the review process. The cycle starts with the letter “A” and will change each time the submittal is processed and sent between Provider and Reviewer. The company & related contact person who is providing the submittals data. The company & related person who the submittal package is being sent to. Companies and replated people who will be sent copies of the submittal package. Creates a filter on Submittal Log. Open will display on Submittal Log, closed will not. Checkbox field indicating the Sender has review the documents included in Package. The Items tab is where items are added to the Submittal Package. Up to this point only information about the package has been entered. One or more items can be added to the Submittal Package. Items can be added from the Project Log or from the Master Spec List. If an item is added from the Master Spec List it will automatically be added to the Project Log. To select an item, click on the + icon to the left of the spec section or on the item description. The item will be added to the Submittal Package Items located beneath the List of Items. Upload files for the Submittal Package on the Attachments tab. Select the “Add File” button to browse the computer and select files to be uploaded. Multiple files can be selected by holding the Ctrl key while making selections in a folder. Files are uploaded to the RADAR server when “Preview and Save” or “Update Draft” button is selected. It may take a few moments for files to upload and save the Submittal Package. A notification will be displayed upon completion. Browse and upload files to the server. Save package and preview the email and Submittal Transmittal to be sent. Select Preview and Send to preview the email and the Submittal Transmittal before sending to recipient. 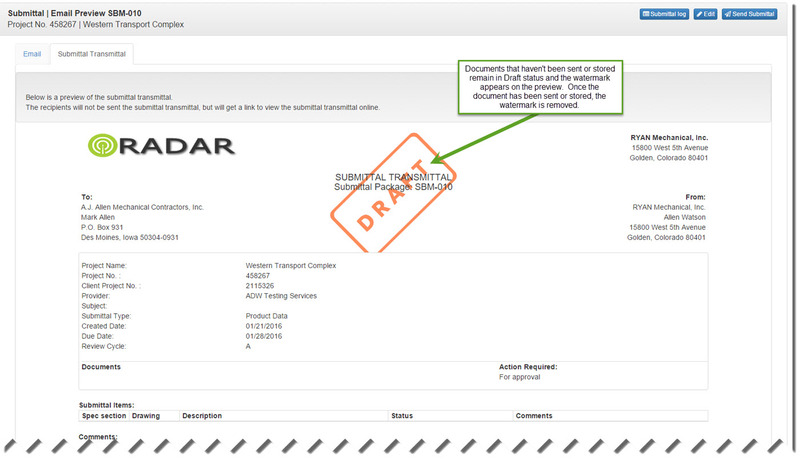 Select the Email tab or the Submittal Transmittal tab to view the documents before sending. Send Submittal: Sends email to recipient and return to Submittal Log. Edit: Continue to edit the document before sending.